David Goerz (1849-1914) and Helene von Riesen Goerz (1851-1928) ca. 1895. Scan provided by Mennonite Library and Archives. David Goerz, a Mennonite (General Conference Mennonite) minister and leader, was born on 2 June 1849, to Heinrich and Agnes Goerz, Neu-Bereslav near Berdyansk, South Russia. He attended the Vereinsschule at Ohrloff in the Molotschna settlement. At the age of 18 he was baptized and began to teach school at Berdyansk, where he married Helene Riesen (1851 - 7 November 1928) on 29 June 1870. He was a close friend of Bernhard Warkentin, who traveled to America on 5 June 1872, and on the basis of the letters which he received from Warkentin spread information about America among the Mennonites of the Ukraine, who had become alarmed by an impending conscription law. 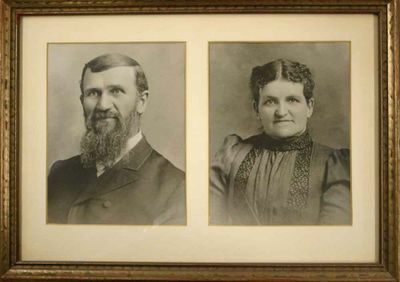 On 4 November 1873, David and Helene Goerz arrived in New York and proceeded to Summerfield, Illinois, where he taught in a Mennonite school. In 1875 he moved with a group of Summerfield Mennonites to Kansas and settled at Halstead, where he served as editor of Zur Heimath, manager of the Western Publishing House, and secretary of the Mennonite Board of Guardians, the American Mennonite agency set up to aid the newly immigrated Mennonites from Russia. In 1877 Goerz was instrumental in organizing the Mennonite Teachers' Conference, of Kansas, which led to the organization of the Kansas Conference of Mennonites and later became the Western District Conference. For years, Goerz was secretary or chairman of this conference. He also promoted home and foreign mission work among the Mennonites and organized the Mennonite Mutual Fire Insurance Company (Newton) in 1880 (later Midland Mutual Fire Insurance Company). In 1900 he made a trip to India to distribute 8,000 bushels of grain among the starving population, which led to the beginning of the General Conference mission work in India. David Goerz was one of the founders of the Bethel College Corporation and served as its first business manager until 1910, when his health compelled him to relinquish this work. Under his influence the Board of Directors of Bethel College in 1903 organized the Bethel Deaconess Home and Hospital Society, which later became an independent institution. In 1878, the Halstead Mennonite Church ordained him as minister and in 1893 he became the pastor of the Bethel College Mennonite Church. He was also instrumental in promoting better music among the Mennonites of the prairie states. David Goerz was a great organizer, inspirer, and leader in the various realms of cultural, educational, missionary, and relief enterprises of the Mennonites of the prairie states in the pioneer days. What has been realized on a large scale in our day was visualized and planned by him by the beginning of the 20th century. In 1910, because of ill health, he made a trip to Palestine and tried to improve his health by retiring to Colorado and later to California, where he died on 7 May 1914. Bethel College Monthly (May 1914): 2-4, 12-16. Dictionary of American Biography VII (1931): 353-354. GRANDMA (The Genealogical Registry and Database of Mennonite Ancestry) Database, 5.00 ed. Fresno, CA: California Mennonite Historical Society, 2006: #398784. Hege, Christian and Christian Neff. Mennonitisches Lexikon, 4 vols. Frankfurt & Weierhof: Hege; Karlsruhe: Schneider, 1913-1967: v. I, 131 f.
Der Herold (14 May 1914). Mennonite Life (October 1952): 170-175. Wedel, P. J. History of Bethel College. North Newton, 1954. David Goerz Collection. Mennonite Library and Archives, Bethel College (North Newton, KS). Krahn, Cornelius. "Goerz, David (1849-1914)." Global Anabaptist Mennonite Encyclopedia Online. 1956. Web. 23 Apr 2019. http://gameo.org/index.php?title=Goerz,_David_(1849-1914)&oldid=130898. Krahn, Cornelius. (1956). Goerz, David (1849-1914). Global Anabaptist Mennonite Encyclopedia Online. Retrieved 23 April 2019, from http://gameo.org/index.php?title=Goerz,_David_(1849-1914)&oldid=130898. Adapted by permission of Herald Press, Harrisonburg, Virginia, from Mennonite Encyclopedia, Vol. 2, p. 536. All rights reserved. This page was last modified on 25 February 2015, at 00:25.